We’re back from our East Coast Adventure, where we traveled 1,200 miles in 12 days and visited six states plus Canada. Our adventure started in Toronto, Canada and ended in the DC area for a family reunion, with stops along the way in Buffalo, Rochester and Syracuse; the Berkshires; and Amish Country. I promise to blog about the trip itself. 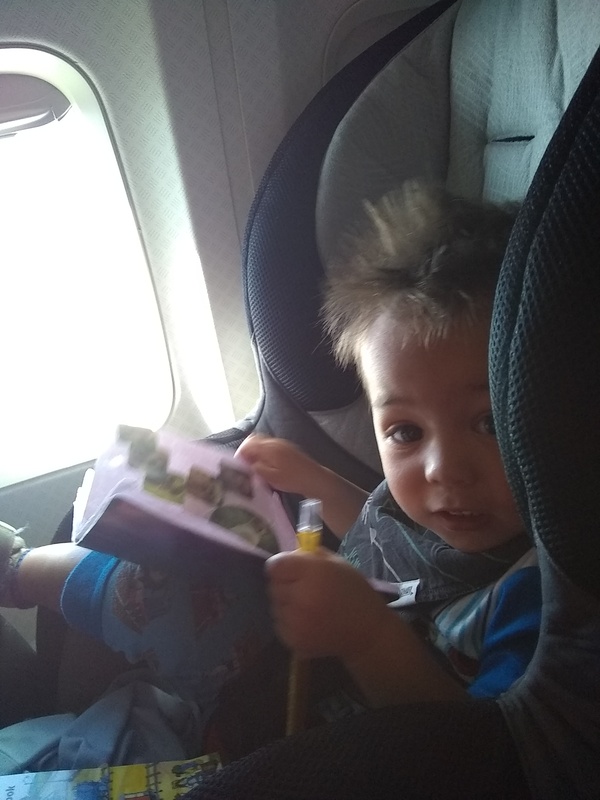 Before I forget, I wanted to share the lessons we learned about going on a long road tripp with young Wilshire, who is presently two and not yet potty-trained. For this trip, we brought along an Evenflo Sureride, which is a Consumer Reports-recommended convertible car seat which retails for about $10o. It’s also light enough so you can carry it over your head, which is a must when you have to get it physically onto the plane while shimmying down a narrow aisle. I decided that I would bring my own car seat after a bad experience with the car seat rented to us by Avis for Will’s first plane trip. Avis gave us a $65 car seat called the Graco ComfortSport that was impossible to install properly unless you had pool noodles. Not a joke. You might be wondering how we managed to get this car seat through the airport and around town, as we flew into Toronto but took a MegaBus back into the US before renting a car. In the end, the easiest thing for me to do was to put the car seat over the umbrella shade of our City Mini stroller. 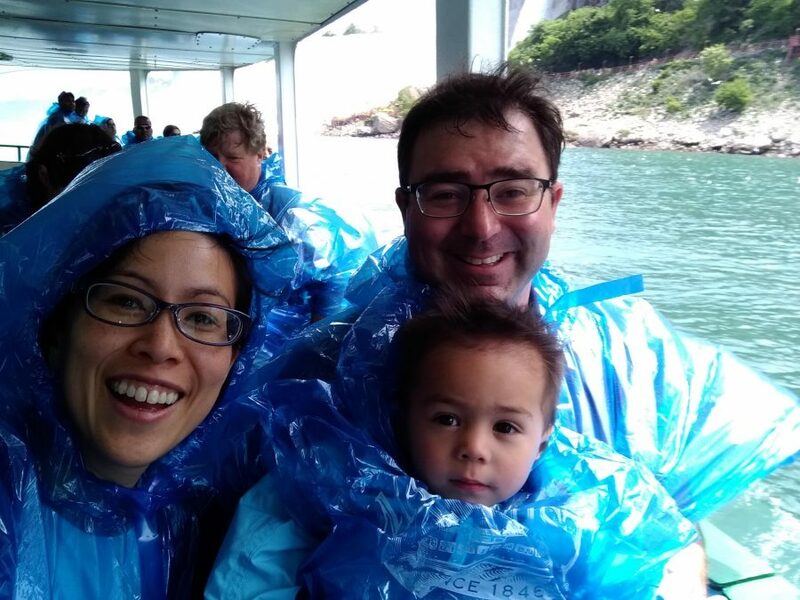 Note that while those contraptions that allow you to strap a car seat to your rollaboard or a stroller cart (we had both) are nice, you will have to make the car seat available for scrutiny at least twice before getting onto the plane. In our case, WestJet’s counter staff wanted to take a look and the car seat has to go through the scanner at the TSA security checkpoint. 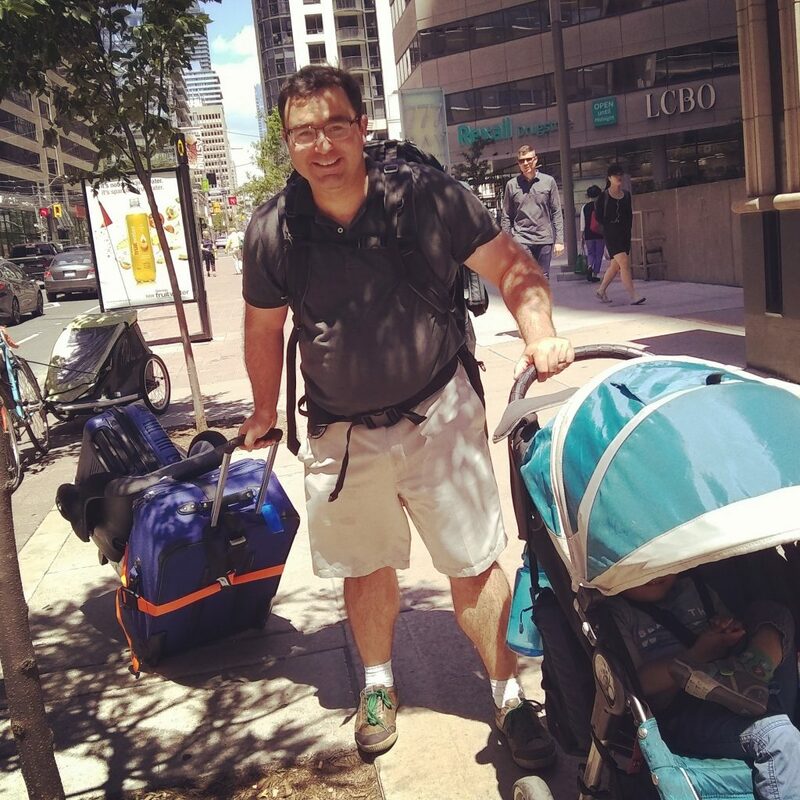 What you see: Wilshire in his City Mini stroller (he’s happy); Juan’s wearing a ginormous backpack AND pulling a suitcase that has a car seat strapped to it (and, for good measure, a rollaboard on the seat). Guess what, it was actually easier to do this to reach the bus terminal instead of getting into a car for 0.5 miles. 2. Pack a Vomit Removal Kit. My vomit removal kit comprises of a wet-dry bag with disposable gloves (a must), plastic bags, a change of clothes for both kid and parent, and pet wipes and a small spray bottle of pet odor removal. Bonus: While on the MegaBus between Toronto and Buffalo, NY, we finally realized that Wilshire tends to puke after drinking milk. We stopped giving him milk while he is in his car seat. Miracle. 3. Rent a full-sized car or larger. Knowing we would be driving over 1,200 miles over the span of just 10 days, Juan and I rented a full-size car from Hertz at the Buffalo Airport for this trip. We wanted a nicer car with sufficient trunk space and a higher-quality suspension than what we’re accustomed to with our Toyota Corolla. We wound up with a 2018 Nissan Altima, which was a comfortable ride and had a spacious trunk. 1) You don’t have to accept the upgrade. Hertz originally gave us a Jeep Compass, a crossover SUV, because there were no full-size cars on site. Within 5 minutes, we knew this car wasn’t going to work out. It didn’t have enough cargo space (everything we brought fit into the trunk of the Altima, which was cheaper to rent). The LATCH hooks in the Jeep Compass were also really difficult to access, which also meant that I would never be able to install my Evenflo car seat properly. Our trip involved driving too many miles to skip this detail. Especially if this is what it takes to get into a car in which you can properly install your kid’s car seat. This isn’t thing to scrimp money on. In our case, I would’ve pushed to take one of the Chrysler minivans I saw in the lot if staff were unable to supply a full-sized car, and I would’ve paid if necessary. 3) Stay nice and polite. The staff at the Hertz counter really truly went the extra mile for us. I think it helped that we traded stories about working in the transportation industry and difficult customers. 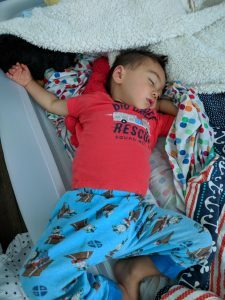 Will slept like a champion in his toddler air bed. Now that Wilshire now sleeps in his own Big Kid Bed, we got this inflatable crib-sized mattress with ‘bumpers’. It was easy to set up. The kid slept in it like a champ. And no matter where we wound up for the night, Will knew he had his own place to sleep – and it wasn’t with us. Tip: To ensure we didn’t forget the ice pack in the hotel refrigerator, we would put a hotel towel inside the cooler bag as a reminder. 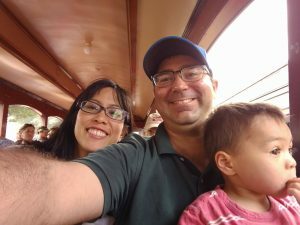 On our longest driving day, we traveled from the Berkshires to Strasburg, PA.
We managed to travel 1,200 miles because we did it over the span of a week. We tried to drive about 3 hours a day, typically in the afternoon in time for Wilshire’s nap, as we found that our son became very fidgety after he’s woken from his nap. Our longest segment was about five hours, and that was only for one day.